Pre-Level 1 - Learning to Read - These books include simple sentences to introduce and reinforce vocabulary. Level 1 - Beginning to Read - Books which have short and simple stories to engage interest. Level 2 – Beginning to Read Alone - Books with longer stories to develop fluency and understanding. Level 3 – Reading Alone - These include more complex stories to build confidence in reading. 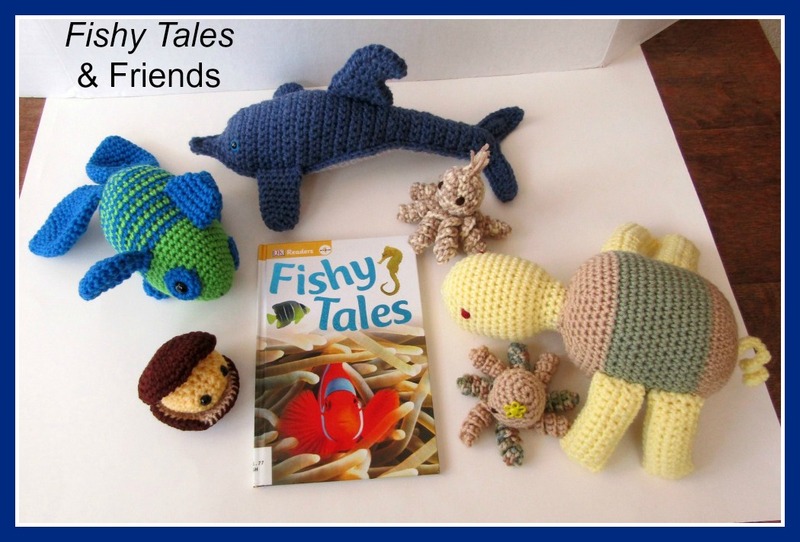 Fishy Tales is a DK Reader in the Pre-Level 1, for children ages 4-6. 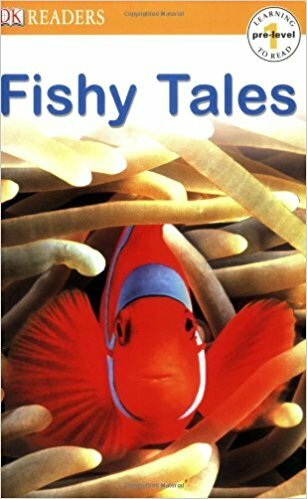 The Fishy Tales story takes a journey in the deep blue sea where we see fish swim through through a coral reef. 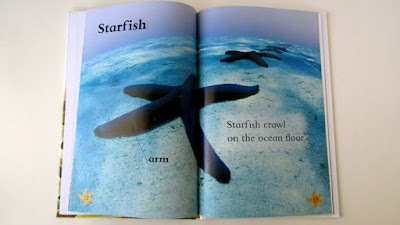 There is also a starfish on the sandy ocean floor and a jellyfish floating up and down in the waves, plus pages about the sea turtle, Sea horses, jellyfish, sharks, octopuses, crabs, eels, rays and dolphins. There are 12 different sea-life creatures shown in two-page spreads with color pictures and simple one sentence descriptions. Each sea animal has words that describe different parts of the animal. Turtles – The turtles play in the ocean. The words Shell and Flipper are labels which point to those matching parts on the turtle. 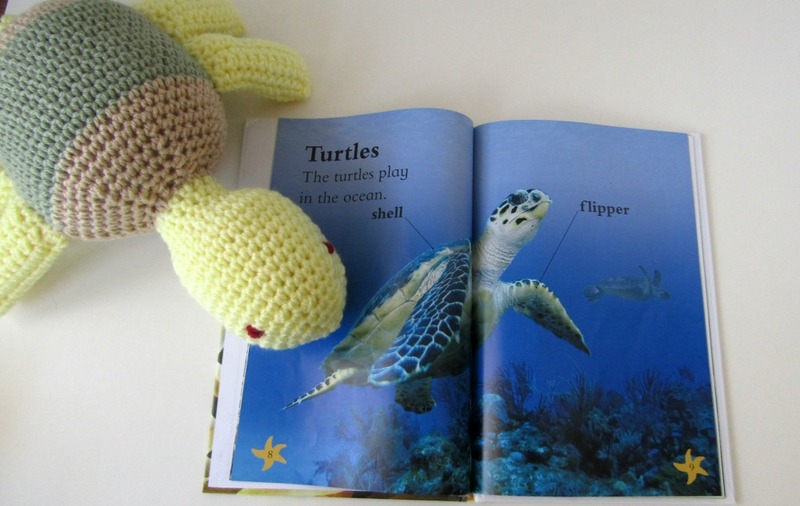 A handmade plush tortoise from my Etsy Toybox loves reading about the sea turtle who lives in the deep blue sea. 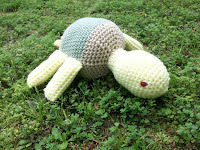 This plush turtle is named Terrance (Terry for short) and he is hand-crocheted. He has a tan body with a sage green shell. His head, legs and tail are done in yellow. His eyes are embroidered. He's soft and cuddly and ready to be hugged by a child who loves turtles. 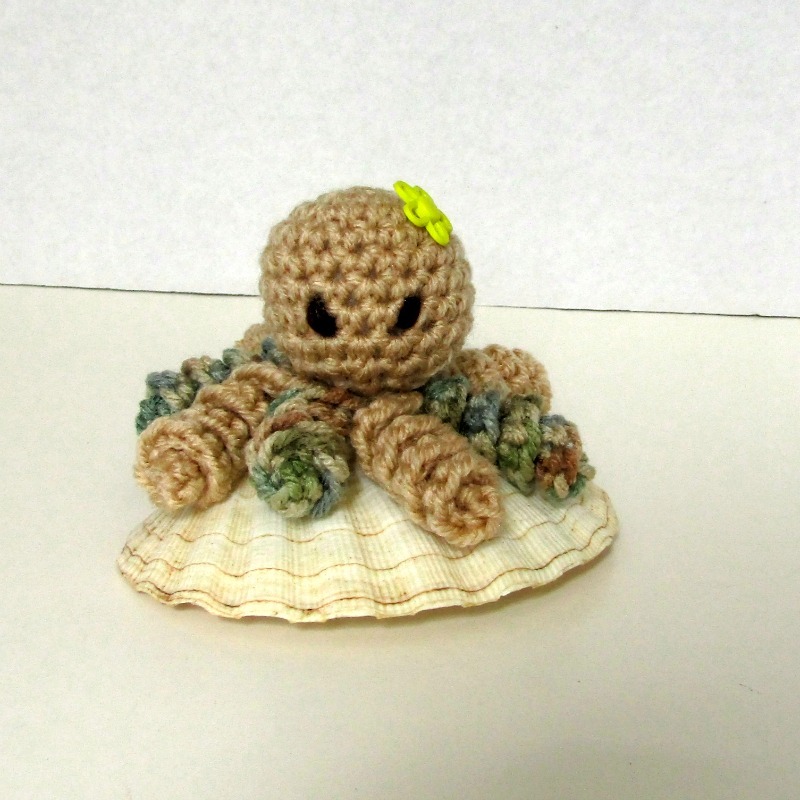 My Etsy Shop doesn't currently have any toy crabs, but this little yellow yarn clam in her clamshell is fascinated by the ocean crabs who can hide in the coral and in big shells. She can imagine how much fun it would be to be 'real' and live by the seashore like the crabs in this story. This two-piece set includes a bright yellow clam with black safety eyes and filled with soft polyfil. The 'clam' measures 3 inches across. 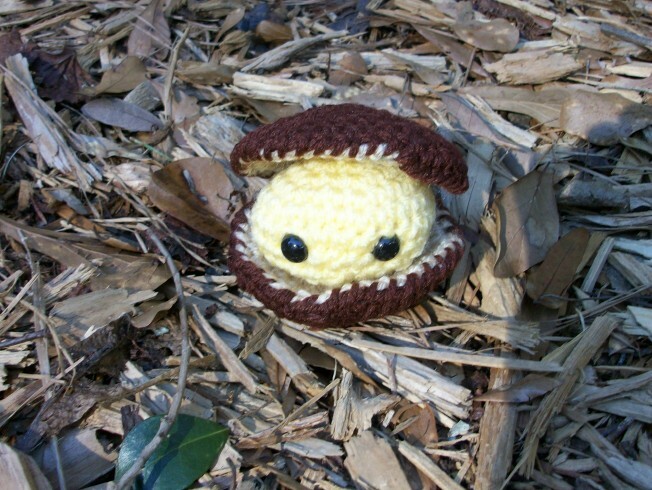 She comes with her own 'clamshell' crocheted in brown and tan. Clamshell measures nearly 4 inches across. Yellow clam loves the sandy beach, but she'd be just as happy living in a child's toy box or reading books with a child. She could also be a friendly plushie sitting on your desk. Colorful fishies swim everywhere through the Coral reef and elsewhere in the ocean. 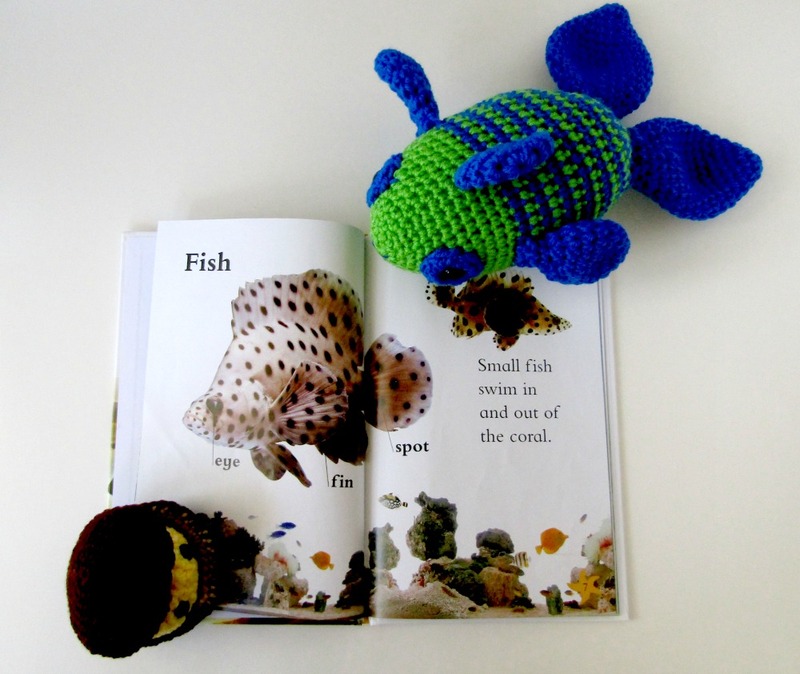 This plush toy tropical fish pretends he could join them when he reads about them in the book. 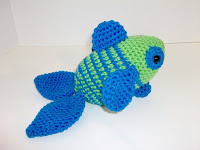 The Tropical fish in my Etsy Shop is handmade in the Amigurumi style of crochet. Fish has two back fins, two side fins, one top fin and one bottom fin -- all crocheted in royal blue yarn. He is stuffed with non-allergenic polyfil and measures 12 inches long from nose to the top of back fins and about 4 inches across the body. Fish is 6" tall from bottom fin to top fin. The many toy octopuses in my Etsy Shop find the page about the octopus in the storybook Fishy Tales to be their favorite, of course. Two of these plush yarn octopuses are busy reading about the octopuses who live in the sea. This plush Mini Octopus with a yellow button flower is hand-crocheted in tan and Aspen Print green-tan-brown ombre yarn. Mini octopus has yarn embroidered eyes and 8 tentacles, which are crocheted spirals. The body is stuffed with a small amount of polyfil. Octopus measures 2.5 inches tall and 5 inches wide. 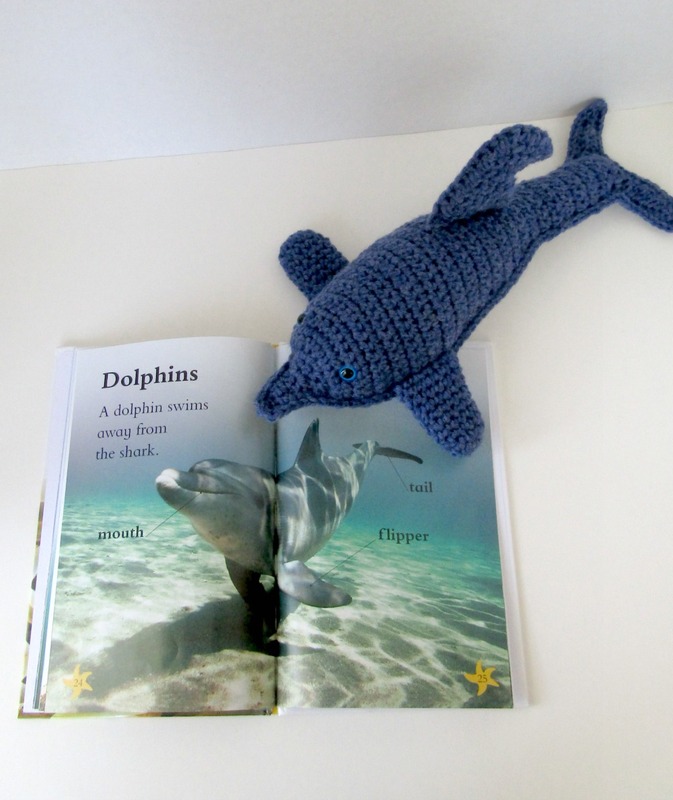 My favorite page in Fishy Tales is the one about the dolphin, as there are multiple dolphins in plush in my Etsy crochet toybox. And, since I live near the ocean, I also get to see real dolphins swimming and leaping in the sea close to my nearest beach. Come meet my replica of a blue Bottlenose Dolphin - a plush, stuffed toy version of a favorite sea animal. 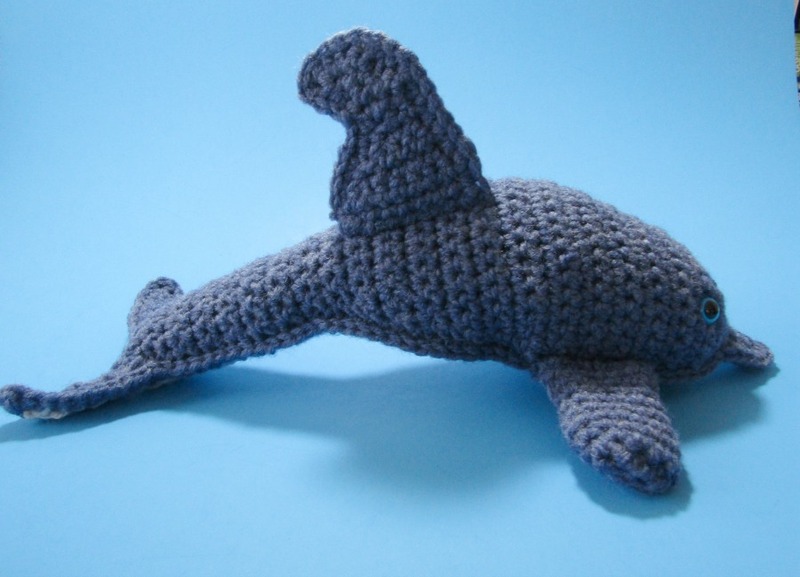 Hand crocheted in denim blue and light gray acrylic yarn and filled with a soft new polyfil, this dolphin is ready to swim his way into your heart. He has a blue top and a light gray underside. Denim Blue Dolphin measures about 14 inches long and 9 inches across his side fins. He is about 3.5 inches high (6 inches at his dorsal fin). His eyes are blue craft eyes. Any child would enjoy reading all about these marvelous sea creatures shown here in Fishy Tales. And we hope you have enjoyed the featured crochet plush sea animals who have also enjoyed reading about the real-life sea animals which were their creators' inspiration in crochet. For more DK Reader books for pre-school and older children, visit their website at DK.com. Or get the DK Readers App at Google Play. I feel like a happy little kid! I love DK books and along with age-appropriate toys, what a great way to put together a gift box of any size for a preschooler! 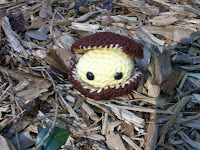 Elf, your crocheted creatures are so adorable and just go so naturally with the book. Love this review! Thanks, Susan. 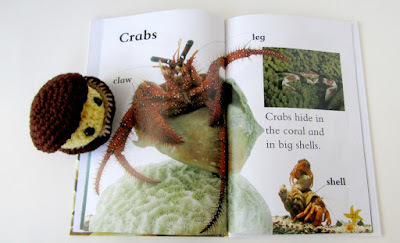 Besides being a delightful 'sea-creature' story, this book gave me lots of ideas for matching crocheted critters! Glad you enjoyed both the book and the plush animals! 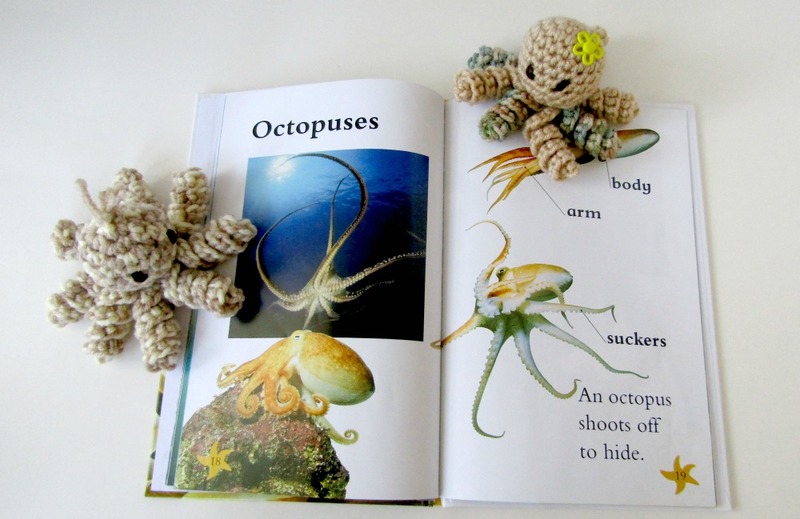 Oh, your little crocheted creatures are truly the perfect companions for the DK readers. The books are awesome! I do love the readers that teach science or history as well as reading. An excellent review of wonderful books and fabulous creatures! Glad you enjoyed it, Mouse. Living near the sea myself, books and ideas for plush animals just naturally appeal to me. What a great combination Miss Elf. Crocheted critters and a book all about them too! I can see lots and lots of little kids just having a ball reading or being read to, while keeping their little fingers busy with all the ocean critters you make. A wonderful combination for sure. Thanks, Olivia. Glad you liked my selections.